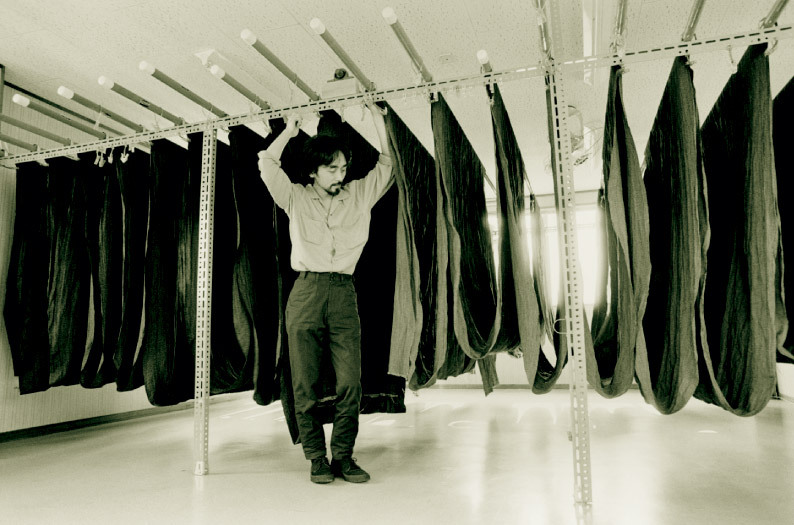 sYohji Yamamoto is the fashion world’s Batman… Both are renowned for their billowing blacks, and they share a disregard for the well-trodden path. Instead the choose to define their own way, and of course, they both personify effortless cool. It’s no wonder then that over the years, just like his comic book counterpart, Yohji has attracted his own band of dedicated fans across the globe. In 1972 Yohji’s started Y’s, his first women’s ready to wear line. Many of the original Y’s pieces were fairly androgynous in design. Indeed, you would be forgiven for mistaking some for menswear. This can make the business of buying vintage Yohji a little confusing at times. Yohji presented his first menswear collection in Paris in 1984. Previously, in 1981, he’d launched his women’s main line. The Pour Homme line is home to his most experimental and high quality pieces. This is the stuff that you’ll predominantly see in his catwalk collections. It’s where many of his most quirky, iconic and desirable items can be found. The Costume D’homme line generally tends to offer slightly more conventional design. At the same time it maintains the wonderful feel and quality one associates with this brand. Personally I love the suits in this line: beautifully crafted, wonderful subtle detailing and lovely loose cuts. Y’s for men was an attempt to create a slightly more accessible clothing range. Therefore, it was made up of the kind of items you could wear day-to-day, whilst still staying true to the Yohji design ethic, of bellowing cuts, dark shades and fine fabrics. It’s a great shame that, due to over-expansion and poor financial management, this line came to an end in 2009. At this time the company went through a period of restructuring. There were a few off-shoots of the Y’s for men line. Y’s for men SHIRTS – as the name suggests, mainly (but by no means entirely) dealt with shirts. This was in much the same way that Comme des Garcons SHIRTS still does to this day. One of my favorites was Y’s for men red label, a line designed in collaboration with Michiko Suzuki in 2006. It was inspired by the emotions of ‘Love’ and ‘Hate’. 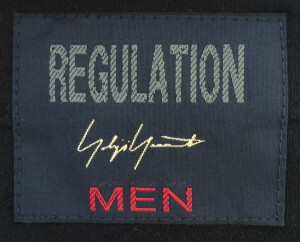 Additionally to Y’s for men, and somewhat confusingly, there is also Y’s men’s label. If you recall, Yohji’s first creations were launched under the Y’s label, which was at the time only a women’s line. Y’s has since expanded to make both men’s and women’s clothes under the same label, so it can be tricky to identify which is which. 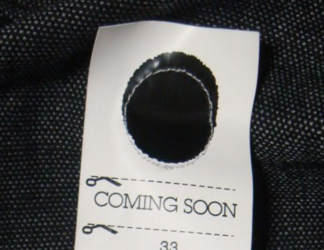 I’ve bought items that said Y’s for men on the tag, yet the label on the garment just says Y’s. So, when buying second-hand, you really need to know what to look out for. For the Y’s lines, my advice would be if the product code starts with an M, then it’s almost always a men’s piece. 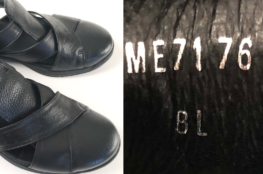 As well as the black Y’s men’s label pictured above, there’s a different line that uses these characteristic slanted ‘Y’s’ and Yohji’s name. This branding perhaps suggests that the man himself had a greater hand in designing these pieces. Yohji Yamamoto Y was an Italian-based extension of the suit production line, launched in 2005. Despite having since having been discontinued, there are some great suits, ties and other accessories still out there to be found if you search. There are some more rare lines you might come across. Gothic Homme – a late 80s/early 90s line, with stark gothic influences. This line is still running to this day, under the Gothic label. Impermeable Homme – a late 80s line, mainly coats and outerwear. Y’s at work – a limited range of workwear. Y’s for living, which sells furniture, household items and bedwear. Yohji Yamamoto Jeans – high quality denin line made for the US/European markets. Y’saccs, operating between 1986-2001, housing some of Y’s miscellaneous goods (watches, ties, bags, etc). 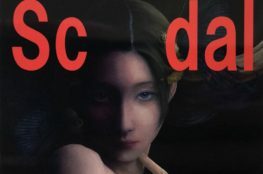 In 2011 Yamamoto Inc. launched S’YTE. The name is “et Y’s” backwards, which means “with Y’s” in French. 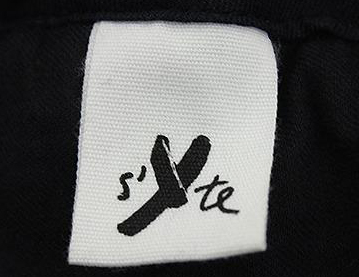 Launched in September 2011, S’YTE is a web-only brand with the positioning as an entry brand. Its products “represent simple and casual style”. 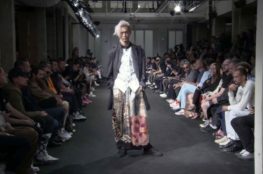 It aims to bring Japanese made fashion to a wider audience. As well as the in-house lines, Yohji has collaborated many times. Perhaps the most famous pairing is Y-3, the luxury street style brand made in conjunction with Adidas. The Y stands for Yohji (or is it Yamamoto, or both!) and the 3 represents the iconic three stripes of Adidas. 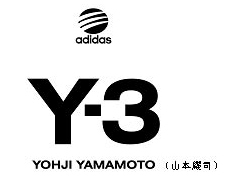 Growing out of an earlier collaboration, Y-3 is one of Yohji’s most successful ventures and is still going strong. 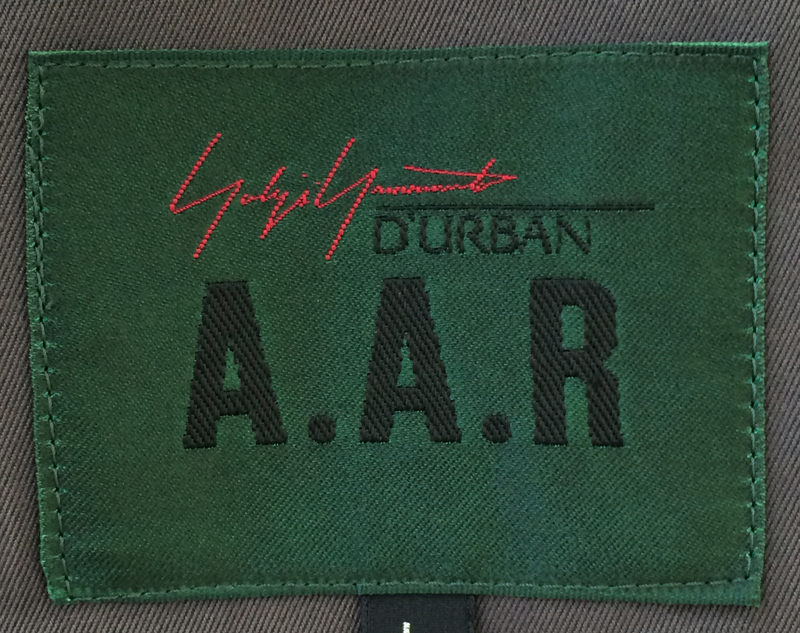 Another more commercially geared collaboration saw Yohji pair-up with Hong Kong fashion house A.A.R. (At All Risks). 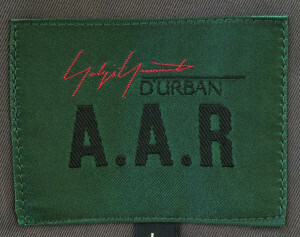 Together they produce the lines Yohji Yamamoto AAR D’Urban, and AAR Yohji design studio. The fabrics aren’t quite what you’d find in Yohji’s high-end lines, but there are still some gems to be found and at fairly reasonable prices too. COMING SOON, described as a ‘super casual capsule collection’, launched in 2008 by Yohji and Italian design licensing company Sinv Spa. Yamamoto Inc’s then CEO Keizo Tamoto heralded it as “a more affordable line aimed at young consumers looking to trade up from streetwear to more elegant pieces”. Yohji has produced footwear in all his main lines. Alongside Y-3, which makes a wide range of footwear, other notable collaborations have been produced with Dr Martens and Repetto. Y’s Mandarina is also noteworthy. It’s a luggage and accessories collaboration between Yohji and Italian-based Mandarina Duck. How else is the dedicated Yohji consumer expected to travel in style?! There have been some additional lines added in recent years. YOHJI YAMAMOTO PRODUCE is managed by his creation team. It aims to reproduce the “archived smash hit products” of the brand. It’s positioned as the entry line to Pour Homme. Ground Y is a unisex line. The concept is “genderless and ageless style”. This is one for Yohji’s creative team to experiment with synchronising some of the different aspects of the brand. ‘Y’s Bang On!’ is a new addition in 2018. It’s another genderless line. The name is a play on the Japanese words ‘ban-go’ and refers to this line being without season. Instead, pieces will have numbers. The first collection is marked from numbers 1 – 13. The brand label has the corresponding number hand stamped on each piece. 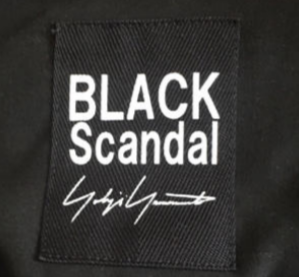 BLACK Scandal was launched in 2018. It’s sold alongside the Pour Homme collections in store across Japan. The designs are cool, dark and stylish. Yohji hand drew some of the designs. This line seems to fit somewhere in between Pour Homme and REGULATION. Whether this line continues to next year is unclear. We’ll keep you posted.